Description: This vibrant halter neck dress in mouth-watering tangerine silk georgette is ideal for older girls. The smocked insert is beaded in bright orange and pink, echoed in the gorgeous flowers with sparkling beaded centres that adorn the dress front. 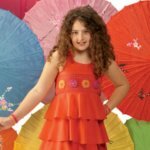 The skirt features three tiers of full, flouncy ruffles and is perfect for twirling about!